The Twenty Dollar Gold Piece c1907 is a high relief coin designed by the noted American sculptor Augustus Saint-Gaudens. The coin was created at the request of President Theodore Roosevelt. Which on the twenty dollar gold piece is much deeper than usual, giving the coin an impressive medallic appearance. Augustus Saint-Gaudens obverse design was considered so beautiful and became so popular that it was re-used on gold bullion coins struck by the U.S. Mint from 1986. Philadelphia. Fr. 182. 33.30 g. Gold. Rare. Only 11,250 pieces struck. 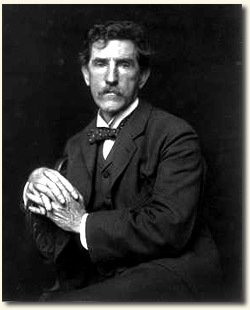 Augustus Saint-Gaudens was born in Dublin, Ireland in 1848. He was the son of a shoemaker, who moved his family to New York. Growing up in the city, Saint-Gaudens became interested in art and after turning thirteen he left school to apprentice with a cameo cutter. While an apprentice, Saint-Gaudens took classes at Cooper Union and the National Academy of Design. At nineteen he moved to Europe, where he continued his studies in both Paris and Rome. Studying classical art and architecture and working as a professional sculptor. He produced a beautiful high-relief $20 gold piece that was adapted into a flattened-down version by the United States Mint. The high-relief coin took up to eleven strikes to bring up the details, and only 12,367 of these coins were minted in 1907. Two major versions of his coins are known as the "Saint Gaudens High Relief Roman Numerals 1907" and the "Saint Gaudens Arabic Numerals 1907?1933". 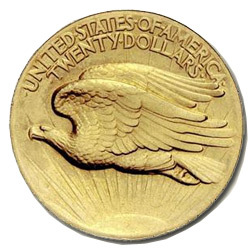 Other extremely rare types of Saint-Gaudens double eagles, minted in 1907, are prized by collectors and valued at between $10,000 and up to millions of dollars. 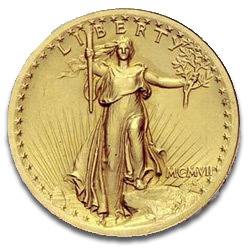 In the modern times, the superb Saint-Gaudens obverse design was reused in the American Eagle gold bullion coins of 1986 and an "ultra-high relief" $20 (24 karat) gold coin was issued by the U.S. Mint in 2009. Augustus Saint-Gaudens referred to his early relief portraits as "medallions" and took a great interest in the art of the coin. His twenty-dollar gold piece, the double eagle coin he designed for the US Mint, 1905?1907, is still considered the most beautiful American coin ever issued. Augustus Saint-Gaudens Died on 3rd August 1907. He died aged 59 from cancer and was a man of the world endorsed with tributes and awards despite his basic education. He left school at 12 but held honorary degrees from Harvard, Yale, and Princeton. In London he was made a member of the prestigious Royal Academy. In France, he was awarded membership of the daunting Legion of Honor. Augustus Saint-Gaudens is buried at Saint-Gaudens Memorial, Cornish, NH.